Global Justice Network is an international group of lawyers which collaborates in the defence of victims of catastrophes all around the world. The network encompasses more than 200 lawyers from 35 countries in the 5 continents, who work conjointly since 2005 to promote Justice. When an accident of great proportions occurs, victims from different countries are frequently affected. Our experts have presence in any place of the world. Our clients speak different languages, as ourselves, besides English. Members of the Global Justice Network are permanently connected sharing information instantly. Each client is supported by the network’s lawyers, and particularly by the experience adapted to your own case. Legal Abroad is an online platform throughout which law firms from four countries, Spain, France, Greece and Italy, offer specialized legal services to personal injury professionals who need support in some of these jurisdictions. The acquisition of documents (police reports in traffic accidents, hospital reports, judicial decrees, etc. ), detailed information about the local systems of personal injury, damage evaluation in accordance with the systems and practices of each country, etc. Legal Abroad sponsors some relevant legal events in our sector, such as conferences in the British Institute of International Comparative Law in London or sectorial conferences organized by Peopil, another network of which BCV Lex is also a member. Legal Abroad is an expandable project and it contemplates the incorporation of law firms from other jurisdiction in a near future. 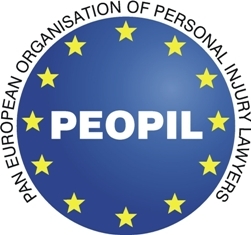 The Pan European Organisation of Personal Injury Lawyers is a non-profit entity which, since 1998, promotes legal cooperation and the expansion of knowledge about legal and judicial systems from the different European jurisdictions in terms of damages. Its purpose consists of fomenting the cooperation between lawyers, making easier the access of consumers or victims to a damage claim, in order to obtain, if necessary by the judicial way, a fair compensation with the professionalism and security needed. The participation of BCVLEX in this association, which meets 550 members from 27 different countries, comes from our interest in participating in the increasing globalisation in the subject of Personal Injury. This Association of Personal Injury Lawyers, based in Nottingham, counts with over 20 years of experience fighting for a better access to justice for victims of personal injury, promoting legal modifications and improving the assistance to victims, all of that throughout the collaboration of more than 4300 member lawyers. This association also collaborates with the organisms in charge of the physical and moral rehabilitation processes of injured people. BCV Lex is a member of this non-profit organisation, positioned on the side of the victims, and reaffirming the values of equity, honesty and integrity in which lay its action. The American Association for Justice, leader among the organisations of American lawyers for victims, has been working for over 65 years for the strengthening of the civil rights legal system in the United States, defending the protection and improvement of the rights of consumers and victims. Liability for medical negligence, the right of consumers before defective products (national manufactured or imported products), risks and accidents at work, etc., are some of our scope of specialisation doing so by having a large platform of professionals and experts dedicated to these multiple subjects. BCV Lex is an active member in the sections of International and Aviation Law.